Fetching dog beds for our four legged friends. An often repeated question on decorating forums is where to find dog beds. 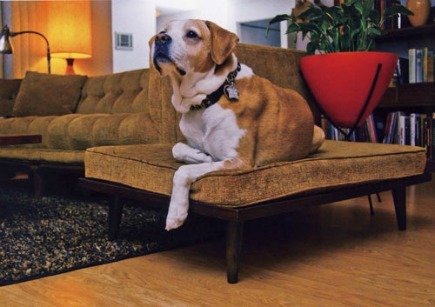 We want our homes to reflect who we are and look their best, but that’s hard to achieve when Fido’s lair is tattered. 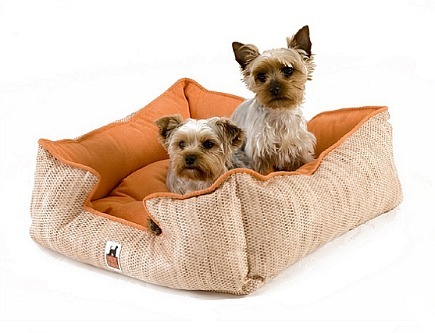 This microsuede bed is reversible, so even the pups can enjoy a change now and then. The removable tufted seat can be used for their comfort when traveling. This custom bed is available in four sizes and three color combos with a three to four week delivery time from Zoomiesnyc. 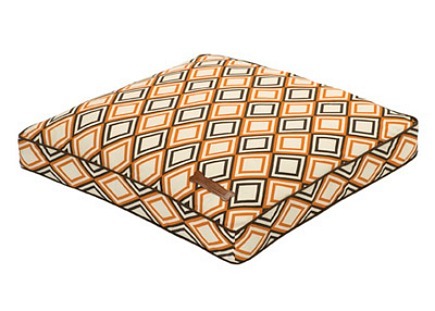 If you have a sprawler, the Metro Classic Pillow bed is contemporary and stylish in an orange and brown geometric print. The material is 100% cotton and filled with Sunstainafill — an allergy free and eco-friendly fiber. This Jax & Bones product comes in three sizes and a multitude of fabrics. 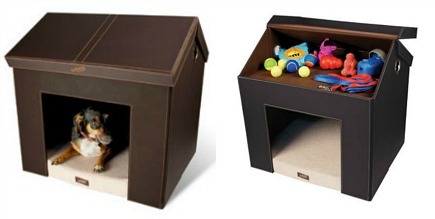 Satisfy your dog’s natural instinct for a “den” with this non-confining safe area for sleeping and relaxing. The dark brown faux leather exterior has contrasting tan stitching. The roof flips open for attic storage for toys, leashes or pet clothing. It also comes with a memory foam pillow with removable terry cover. The Pet Haven is easily broken down (no tools required) and comes with its own carrying case. A couple featured in Atomic Ranch went all out for their beagle. They used salvaged parts paired with materials from the home improvement store to create a one-of-a-kind bed, topped with an upholstered cushion to match their Mid Century Modern sectional sofa. See more stylish pet-friendly ideas in Crypton Super Fabrics and Built-ins For Pets. I LOVE that last picture. Perfect addition to the living room. My question is whether or not the dog stays on it. Wouldn’t matter really it just looks cool. What about a bed for two wild Talladega, Alabama country dogs? They are not quite as nice and calm as the guys featured in the pictures. They seem to like their denim beds from Target…but we might need to upgrade when we move into our long awaited house. I, too, really love that last idea. A good way to keep doggy off the furniture where people want to sit NOT in dog hair, but make him feel part of the family, and think he’s on the couch.